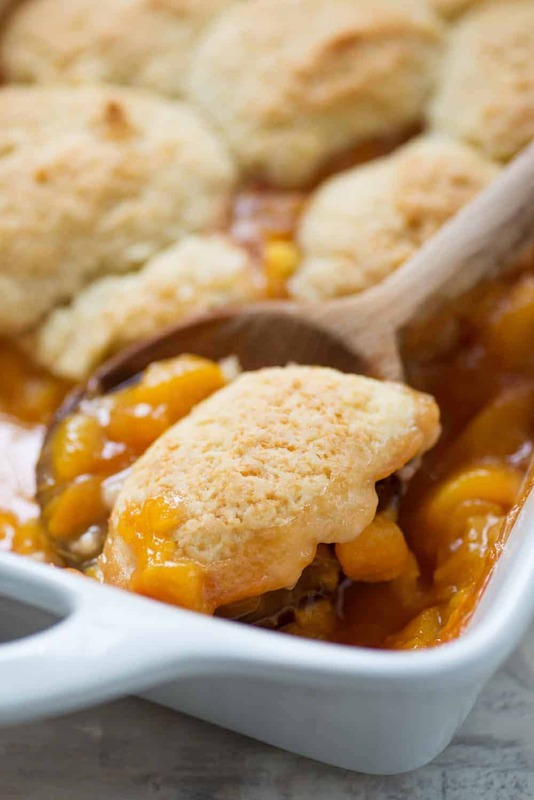 I almost didn’t post this vegan peach cobbler recipe this year. Even though we’ve made this one 3 times over the past month — and even though BL said this is his new favorite dessert. I posted a vegan cherry cobbler recipe a few weeks ago and I wasn’t sure if you wanted TWO cobbler recipes in the same month. And, I reposted my peach pie bars a week after that. Do we need that much dessert? But then I made this cobbler again last week and decided that yes, you needed it. 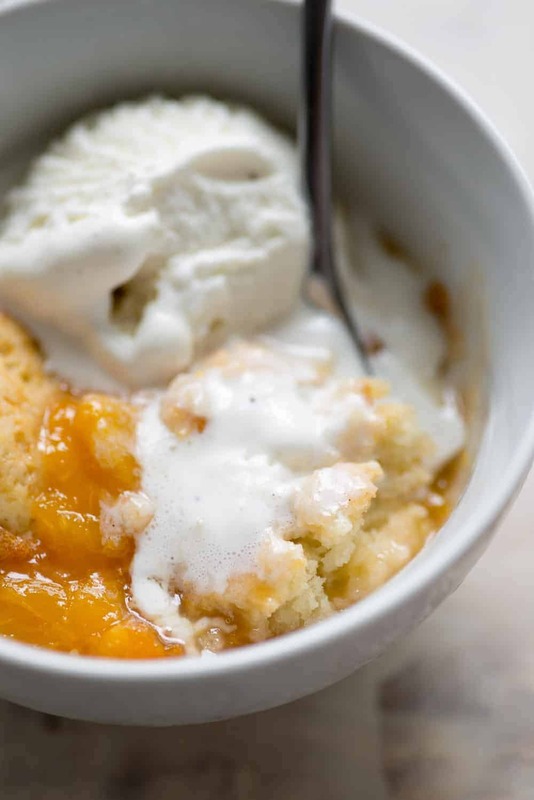 It’s different enough from the other cobbler recipe and one of the best way to enjoy fresh peaches. Are we still loving peaches? We can’t get enough of them this summer; I’m fairly certain that Vander and I split one almost every afternoon. They are just so good right now; juicy, plump, amazing. I can also get them for roughly $1.29 a pound, which is a steal. I even picked up 10 extra pounds last weekend to make ginger-peach jam. Ah, I really can’t get enough. The cherry cobbler that I made a few weeks ago is a little different than this one. That version had more of a biscuit topping, this one is mix between a pie crust and a pillowy dough. 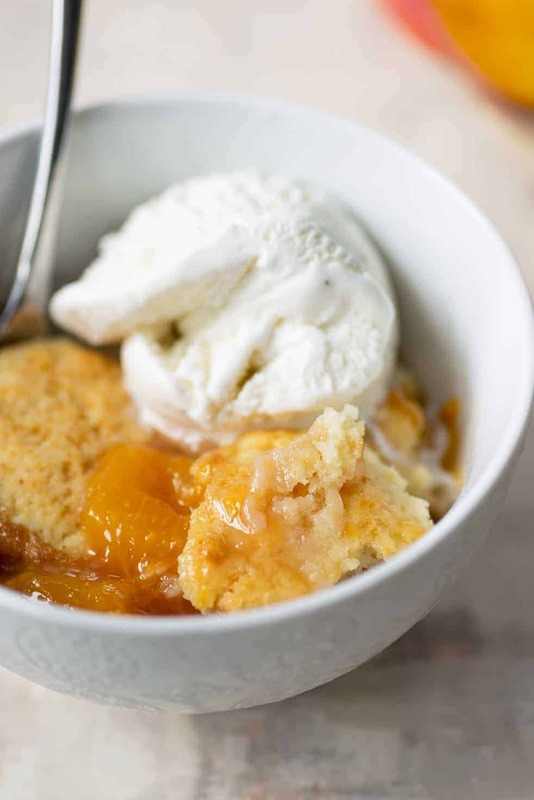 I wanted a topping that almost covered all of the peaches so you get a bite of cobbler topping and sweet peaches in every bite. This recipe only contains 8 ingredients! 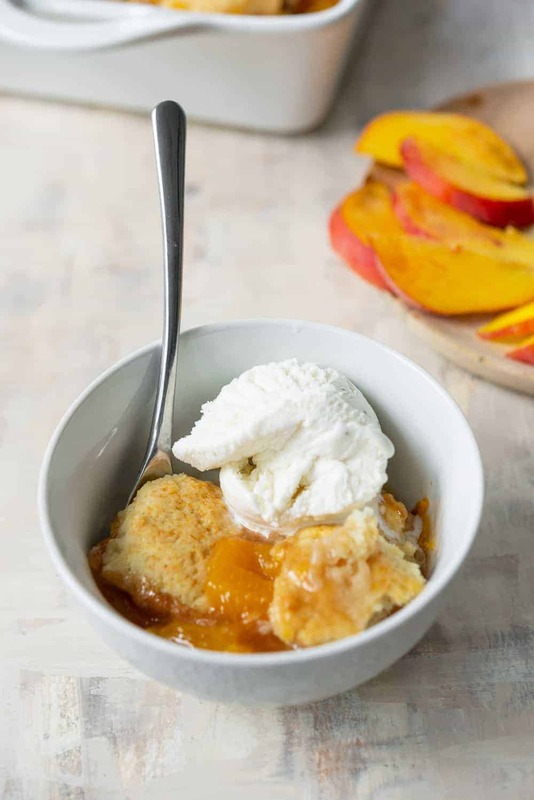 Super simple and easier than any type of pie or other peach recipe. That’s where my brain is at right now- simple, simple, simple. Toss the fresh peach slices with sugar and cinnamon then place in the bottom of a baking dish. Then, cover with a simple biscuit topping and bake. That’s it! 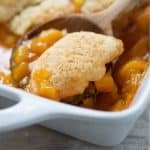 Vegan Peach Cobbler! 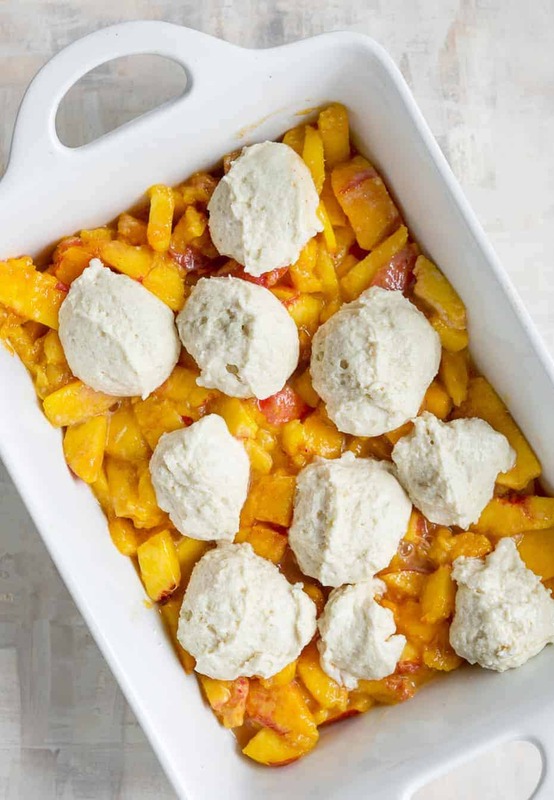 Fresh peaches topped with yummy cobbler topping and baked until bubbly. Perfect for summer and amazing with ice cream. 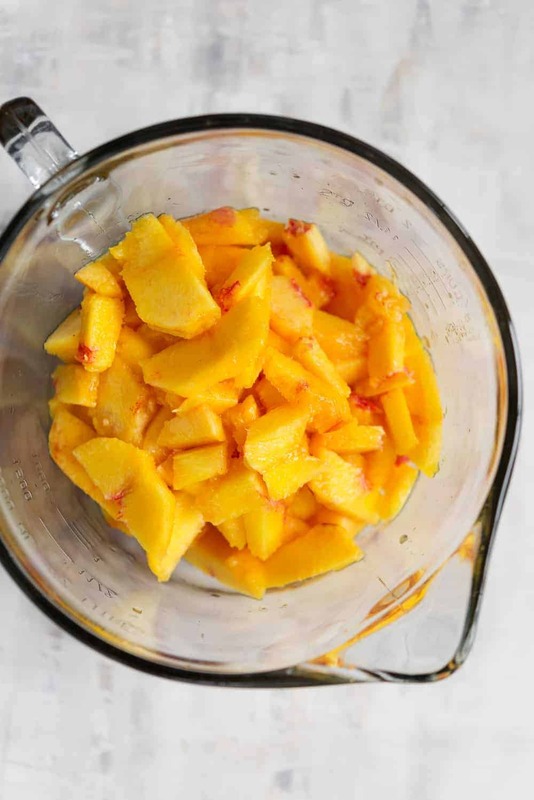 Toss together the sliced peaches, 1/3 cup sugar, 2 tablespoons flour and 1 teaspoon ground cinnamon. Pour in the bottom of a lightly greased 9×13″ pan. In a separate bowl, whisk together the flour, sugar, baking powder and salt. Add in the oil and coconut milk and whisk to just combine, taking care not to over mix. Spread the mixture over the peaches and place in the oven. Bake for 30-35 minutes until golden browned and bubbly. Remove, let cool slightly and enjoy! We love this best with some ice cream. I think coconut milk beverage works best here, but you can use any non-dairy beverage that you’d like. Oh my family is going to be SOOO happy I found this recipe! Peaches are a huge favorite with my crowd, so thank you! Just what I need for my book club where the last book we read was set in Atlanta, and I wanted to create a Georgia favorite! Thanks!